Five years after Don Pietro Leone’s first contribution to our site, on the Roman Liturgy, we are happy to present the following essay on Ecumenism. We also recommend to our readers Pius XI’s encyclical Mortalium Animos, issued on January 6, The Feast of the Epiphany, 1928, which contains everything a Catholic needs to know in order to evaluate ecumenism correctly. Don Pietro Leone is the pen name of a priest who celebrates the traditional Mass in full and peaceful communion with his Ordinary somewhere in that great cradle of civilization known as Italy. In the Arms and Armoury Department of his Infernal workshop, Satan certainly gives pride of place to Ecumenism. Ask him to show you on your trip around Hell, if you ever have the misfortune to end up there. This powerful weapon is of recent date. It has been elaborated for the present age when Faith is growing cold, and is designed to speed up the process. Your first reaction will be one of admiration: ‘What a beautiful artefact!’ you will say. Your second reaction, when you look at it more carefully, will be one of surprise, to find that it is completely hollow. ‘All our weapons are hollow’ he will curtly reply. ‘Have you not yet understood anything at all? What’s important is the look of the thing. But it’s true’, he concedes after a moment’s thought, ‘this one is particularly hollow’. Ecumenism is without substance: it is hollow both logically and morally. There are two forms of Ecumenism. The first aims at the union of all the Christian confessions, or all ‘religions’ (or ‘faiths’), maintaining that they are all true; the second aims at this union on the basis of their lowest common denominator. We shall present the logical incoherence of each in turn. Regarding the first type, we quote St. Pius X in Pascendi: ‘Modernists do not deny, but actually admit, some in a veiled manner, others quite openly, that all religions are true.’ The Pope is referring to a subjectivist conception of religion which is reduced to the personal experience each person has of God in their own religion, along with the symbolism that belongs to it. This conception was condemned by him in the Decree Lamentabili and in the abovementioned Encyclical Pascendi. This does not however mean that there are not many who are pleased to assert that all faiths and religions are true, even on the objective concept of faith and religion. It should be replied that this assertion offends against the principle of non-contradiction, since there is only one reality, and each faith or religion presents a different and exclusive vision of it. For this reason, the convinced believer in any religion or faith claims that his vision is right and the visions of the other believers are wrong: in short, he claims that his faith or religion is the only true faith and religion that there is. The One Holy Roman Catholic Church can go even further and say not only that Hers is the only true faith and religion, but that it is the only faith and religion tout court. For the Church teaches that Faith is a type of knowledge, that is to say the knowledge of reality: the reality that is God; and since there is only one reality and only one God, there cannot be more than one knowledge of this one reality, of this one reality that is God. Furthermore, the Church teaches that only the Catholic Faith (along with Baptism) unites us to this God, and that therefore the Catholic Faith is also the only religion, since ‘religion’ means nothing other than that spiritual system which binds us (ligat in Latin) to God. The popularity of the theory that all ‘faiths’ or ‘religions’ are objectively true shows us the extent to which the man of to-day has become incapable of rational thinking – even if the absurdity of such a theory certainly does not render it any less respectable in the eyes of the Modernists. The second form of Ecumenism reduces the Faith to an amalgam of different beliefs which it then compares with those of other ‘faiths’ or ‘religions’ in search of a common base for union. The One, Holy, Roman Catholic Church, by contrast, teaches that the Faith constitutes an indivisible unity, whch derives from its object: God as He is in Himself. For this reason it is not possible to prescind from any Catholic doctrine whatsoever in the interests of conformity to others. Ecumenism is presented as a type of spiritual union which aims at a spiritual good. In a word, it is presented as a type of spiritual love, that is, among members of the Catholic Church and those outside it. But it does not constitute spiritual love, since it consists neither in spiritual union (in any substantial sense of the term) nor in any form of spiritual good. c) The union of the Catholic Faith. This is the only type of union that the Catholic Church has the mandate to establish with others, since only this type of union can effect their spiritual good in the ultimate sense of the word, that is to say their salvation. The union sought by Ecumenism, on the other hand, is simply a partial union, inasmuch as one or more of these three elements are missing. For this reason it does not have the power to redeem. ii) The spiritual union sought by Ecumenism is not redeeming, then. But typically it is not supernatural either, as Ecumenism typically reduces Catholicism to the Faith (understood simply as an assortment of different beliefs) and, in so doing, ignores the sacraments, which are the necessary means for uniting us to God here on earth and in Heaven. We note that in the two documents of the Second Vatican Council Ad Gentes and Nostra Aetate which refer to the relationship between the Church and non-Christian religions, the term ‘supernatural’ is nowhere to be found. iii) The spiritual union sought by Ecumenism is typically not moral either, as it tends to reduce the Faith to those doctrines which concern the nature and the Reality of God. In so doing, however, it neglects the moral doctrines that are an essential part of the Faith, and which are also necessary for eternal life, since the Faith is the light that shows us the path to Heaven. The type of good promoted exclusively by Ecumenism is not salvation, but merely earthly peace and happiness, which is not a spiritual good at all. Furthermore, this is not the primary or essential task of the Church. The Church, as we have just indicated, was founded for the eternal good of man: for his salvation. Ecumenism, on the other hand, aims solely at his earthly good. It is not then a spiritual initiative, but merely a political one. Man’s earthly good is at most a secondary duty of the Church, as a consequence of Her primary task which is his eternal good. Perhaps some-one will try to defend this false Ecumenism, which is the search for man’s earthly good, by maintaining that it is nonetheless a form of love, even if not spiritual, and saying that ‘Love is sufficient’, that in the final analysis love is the reason for our life and that God Himself is love: in the sense that the Most Holy Trinity is a mystery of love among the Three Divine Persons. Let us then investigate in greater detail the nature of ecumenical love, first the element of union, then the good that this union is intended to produce. What is it that unites the parties to ecumenical initiatives? Common beliefs and ideals, to the exclusion of doctrinal differences. This principle is typically expressed with the slogan ‘It is important what we have in common, not what separates us’. In relation to the other Religions in particular, it is often expressed by the slogan: ‘We adore the same God’. These common beliefs and ideals provide the basis for ‘Dialogue’, a process not oriented to establishing objective Truth, but simply fraternal exchange, a process which places the two parties on the same footing on the implicit understanding that neither will try to impose his vision of Truth on the other. They provide the basis equally for common enterprises such as inter-religious or inter-confessional assemblies, or diplomatic gestures such as tree-plantings and embraces. What is remarkable about ecumenical union is that it prescinds from objective Truth. This however is irrational, for in order to enter into relations with other Christian confessions or other Religions in a rational, realistic way, we must clearly take into consideration the whole Truth and not just a part of it: not only common beliefs and ideals but also doctrinal differences. In fact, after a moment’s reflection, we can see that it is not so much that which we have in common with other confessions and religions which is important, but that which separates us: since what separates us is the Faith, and Faith holds the key to eternal life. Let us take the example of the other monotheistic Religions: Judaism and Islam. The fact that they ‘adore the same God’ as we do is irrelevant. For the God that they adore is the same as the God of the Catholic Faith only in a philosophical sense: as Being Itself, as Creator and End of all things; whereas the God that they adore is not the same as the God of the Catholic Faith in a theological sense, in the sense of the Faith, for God in a theological sense is the Most Holy Trinity Whom they deny. What is important here, then, as we have just explained, is what separates us: the belief in the God of the Catholic Faith, because only this belief is salvific. What good is envisaged by ecumenism? Man’s earthly, or political, good. This would indeed justify the ecumenical enterprise were it not for the evils that this enterprise engenders (cf. section III). In a word, Ecumenism offers man an earthly good at the expense of his spiritual good. We conclude that Ecumenism is not the type of love that is appropriate between the Church and other Religions or Confessions. The appropriate type of love is rather Evangelization, since, like every form of rational love, it aims at the true good of the other, indeed at their supreme good which is their salvation, which it seeks to assure through their conversion. That the type of love proposed by Ecumenism is inappropriate may be illustrated by the following image: A quantity of people are trying to cross an ocean. A number are travelling on a large boat built to survive storms and all types of danger and furnished with everything necessary for a long voyage. Others are travelling in smaller boats: sailing-boats, rowing-boats; others on rafts or lilos; others are simply swimming. Only the large boat will reach the other side safely; some of the other boats may arrive but with great difficulty; the other boats and people on the other hand will certainly not arrive. Those on the large boat do not try to persuade the others to come on board but just greet them blithely as they pass. As the reader will have understood, the big boat is the Catholic Church; the ocean is the world; the people outside the boat are those who do not belong to the Church, or at least not to the Body of the Church. It is obviously easier and also more fun, at least for the time being, to wave and smile blithely at another from a beautiful boat, than to tell him that he is making a mistake, to persuade him to leave his boat (which he probably also quite likes), and to come on board one’s own. What is more, if he does come on board, there will be the whole bother of looking after him. We said that false Ecumenism is an inappropriate type of love. How might we characterize it more precisely? Inasmuch as it prescinds from objective Truth, it is irrational as we have suggested above, and thus does not constitute rational love, but only emotional love. It may be characterized more precisely as sentimentality. This sentimentality made its first official appearance in the Church in the texts of the Second Vatican Council, in their soft and conciliatory language and attitudes towards other religions and above all towards the contemporary world, and in a new ethical doctrine, that the primary end of marriage is ‘love’. As a surrogate of true love, that is to say of the virtue of love, this sentimental love is effeminate and emasculated. In virtue of the lack of formation and vigilance of the Clergy and the faithful, it was able to pass itself off in the above mentioned Council as true love. The metaphysical error underlying Ecumenism is the priority that it accords to the Order of the Good over the Order of the True. The soul of man has two principle faculties: knowledge and will (or rational love), and both need to be employed in his acting. The deepest reason for this is that both of these faculties are necessary to man in order to glorify God fully. To the objection that ‘Love is sufficient’, then, we respond with the affirmation that knowledge is also necessary. It needs to be added moreover that knowledge has (logical) precedence over love, inasmuch as love is blind, and needs to be guided by knowledge: before loving, we need to know what to love and how to love. If a drunkard asks me for a hundred ‘euros’ and I give them to him, I am not loving him. And if some-one is trying to cross the Ocean by swimming, I am not loving him by merely waving at him from my beautiful yacht as I pass. On the supernatural level, the knowledge in question is the Faith, and the love in question is Charity. Both – Faith and Charity – must be employed in man’s actions. It is not sufficient to have Faith in order to be saved; it is not sufficient to love in order to be saved: both Faith and Charity are needed. Moreover, Faith (as supernatural knowledge) has logical precedence over Charity (as supernatural love). The object of Faith is God, the Most Holy Trinity, and we are unable to love Him with Charity (and our neighbor in Him and for the sake of Him) before knowing Him by Faith. At an even deeper level, we can say with Professor Romano Amerio in his admirable book, Iota Unum, that knowledge precedes love in the ultimate sense in the Most Holy Trinity Itself, since knowledge of God through the Word precedes the love of God through the Holy Spirit: the Procession of the Son from the Intellect of the Father precedes the Procession of the Holy Spirit from the reciprocal Love of the Father and the Son. In this way we may say that God, prior to being a mystery of Love, is a mystery of Truth. The priority in question here, as before, is a logical priority: the Father and the Son are consubstantial and their reciprocal relationships are not temporally distinct. We see then that the Ecumenists are wrong when they act as if love is all that matters, since – we repeat – both knowledge and love are necessary, where knowledge has logical precedence over love: Faith over Charity: the Order of the True over the Order of the Good. We have called Ecumenism a surrogate love. Who invented it if not the Devil, the Imitator of God and the Master of all Deceit? It is his invention, or rather a new use of a former invention of his, which is that of the False Religions. For he created the False, or non-Catholic, religions with the object of drawing man away from his final end which is Heaven. To this end the Exterminator was careful to preserve some elements of Objective Truth and Goodness in them, in order to make his product more attractive and acceptable to his victims. In the present age he has used these same elements, he has presented these same elements, as something positive, that is, as ‘What we have in common’ in order to orchestrate the great Ecumenical Charade of specious, sentimental love for the corrosion of the Catholic Faith: surrogate religions for surrogate evangelization by surrogate love. What evils does this corrosion of the Catholic Faith comprise? 1) The first evil of Ecumenism is that it obscures the Faith. Indeed, as a typical modernist initiative, Ecumenism is by its very nature obscurantist. If the Pope embraces the Dalai Lama, if he prays with him or some other religious leader; if a Catholic priest recites the words of Consecration of the Holy Mass along with a Protestant minister, they would appear to have some spiritual common ground, but in what precisely does this consist? It is unclear. What Ecumenism particularly obscures is the uniqueness of the Catholic Faith. For in putting the Catholic Faith on the same level as other ‘Faiths’ or ‘Religions’ it obscures the fact that it is the one true Faith and Religion and the only one that can save man, as it contains in itself the fullness of the doctrines and Sacraments necessary for salvation. 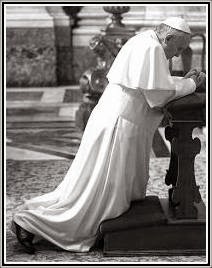 2) The Catholic who in some ecumenical gesture is interested only in what he has in common with other Christian confessions or other religions and what unites him to them, weakens the Faith (his own, and that of any others who may be witness to the gesture) in those articles that he passes over in silence. For example, he who is interested only in that which unites him to the Lutherans, silences and subsequently weakens Faith in the sacrificial nature of Holy Mass and the seven Sacraments, as well as the cult of Our Lady; he who is interested in what unites him to the Jews or Muslims, silences and weakens Faith in the mystery of the Most Holy Trinity as well as the Divinity and redeeming mission of Our Lord Jesus Christ, which constitute the very nucleus of the Faith. 3) He who obscures and weakens the Faith, diminishes the very possibility of salvation (his own and that of any others who may witness the gesture). 4) Ecumenism humiliates the Church in placing the Immaculate Bride of Christ on the same level as the inventions of the Devil. 5) It offends Our Lord Jesus Christ as Founder of the Church in placing Him on the same level as the founders of the other ‘Religions’ who deny, reject, or blaspheme Him. 7) He who in this illegitimate process of rapprochement towards other confessions or religions goes as far as to deny even one single article of Faith, not only weakens his Faith, but falls into heresy and loses it entirely. 8) He who denies the whole Faith, or the nucleus of the Faith, falls into apostasy. 9) On the global level, Catholicism, through inter-confessional Ecumenism, collapses, as we are already able painfully to witness, into a kind of vague Humanism lightly tinged by Christianity. b) an amalgam of the monotheistic religions. This second form of religion has two types: the first, a vague deism; the second, a monotheism which retains what the three great monotheistic religions have in common theologically, that is to say, at least theoretically, the Old Testament. In this way Catholicism dissolves effectively into Judaism, or more precisely into the Jewish-Masonic world religion known as ‘Noachism’. Was this the motive of Our Lord’s Incarnation, Life, Passion and Death on the Cross amid the most atrocious spasms of pain? We conclude this essay by summarizing briefly the points on which Ecumenism and Evangelization converge and diverge. Both Ecumenism and Evangelization have a pretension to universality. 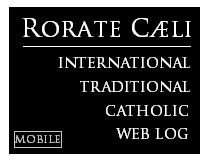 The former term, which derives from a Greek word for ‘world’, signifies in effect the accommodation of the Catholic Faith to all other confessions or religions of the world. The latter term, as is clear from a glance at the end of all the Synoptic Gospels, signifies the catechesis, baptism, and conversion of the whole world to the One Catholic Faith. Both Ecumenism and Evangelization are types of love: both aim at union between parties in view of a prospective good. Ecumenism seeks union on the basis of shared beliefs, of ‘Dialogue’ understood as a form of mouvement perpetuel, and of embraces. It looks towards a merely earthly, or political, good. Evangelization, by contrast, seeks union on the basis of the One True Faith, the seven Sacraments, and submission to the Roman Pontiff. It looks towards man’s eternal good in Heaven. Ecumenism and Evangelization diverge most markedly in regard to the Truth. Ecumenism is not interested in Truth; Evangelization by contrast holds it as all-important, for Evangelization consists precisely in the announcement of the Truth: in the communication of the Truth to one who is in ignorance of the Truth, in order that he too might come into possession of it, and so be saved. This Truth in the ultimate sense is none other than the Most Holy Trinity, Who has created man in order that man, and every man without exception, might know and love Him here on earth, and so attain his eternal beatitude in Heaven. Amen.